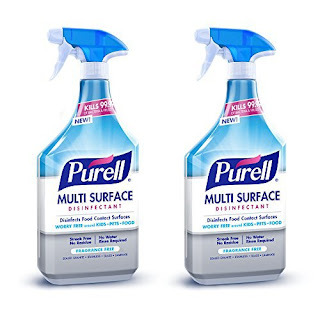 Right now Amazon has the PURELL Multi Surface Disinfectant Spray – Fragrance Free, 28 oz. Spray Bottle (Pack of 2) for ONLY $6.50 (Retail $12.99)! Formulated to kill 99.99% of germs on the surfaces you touch. Worry-free on food prep surfaces, kids' toys, near pets, and on a variety of hard and soft surfaces throughout your home. No water rinse required, no harsh chemicals found in traditional surface disinfectants and cleaners. Kill the cold &amp; flu viruses, norovirus, e. coli and many other common germs in just 30 seconds. Works quickly to disinfect and clean in just one step on sealed granite, stainless, glass, laminate and more.